This practice is as much seeing the value range of your drawing pens and pencils as it is an exercise toward achieving the right shading in your drawings. You will need three things to complete the shading exercises - 1. paper, 2. pencils and 3. a pencil sharpener. Printer paper will be used for these exercises if you print the value scale printable files that are on this page instead of drawing them. At some point, the student should draw the value scales. Pencils - any set of drawing pencils should be okay. Look for pencils that are rated with the graphite grading scales. 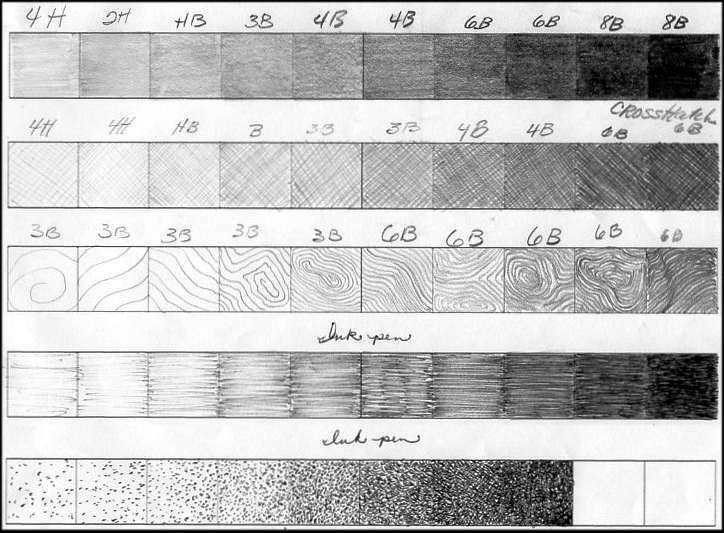 If you do not know what graphite grading scales are, keep reading-- oh, I will just tell you- it is the pencil hardness rating. Assignment: Each day, at least once, fill in one row of squares shading darkest to lightest using pencils or pens. The illustration below shows a completed value scale. Value Scale with Strip 1 - Match the values that are in the shaded strips when filling in the space between the strips. Value Scale with Strip 2 - Challenging - This one has 3 strips per lesson. While matching the starting values of the strips, shade toward the next strip so that the shade matches. Below is a value scale that is filled in with pen and pin and it is an example of using the scale for shading/value practice. The pencil hardness rating (graphite grading scales) is recorded. The list below describes the example. Draw a long thin rectangle on a page in your drawing notebook. With a pen/ink or with a pencil, draw in the rectangle minuscule strokes shading from dark to light. Being able to replicate a gradated shade is important in all colors. The image below and the larger image above shows an examples of pencil hardness from 4H through 8B. With Pencil- In Exercise IV, Ruskin describes the shading exercise using pencil and if you read on, he elaborates why a student of drawing must take great pains to work patiently.